This interesting black leather travel set features two different games all combined into one exciting package. 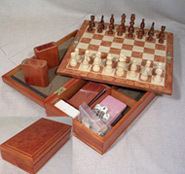 This set offers chess on one side and backgammon on the opposite side of the attaché. Inside the case there is plenty of storage for your game accessories. Folding compact design snaps shut and makes it easy to store while on the go. A fantastic portable combination game set. Packed with a large variety of gaming options, this unique combination set satisfies the most demanding game enthusiasts. Choose from seven different games including chess, checkers, backgammon, dominoes, cards, dice and cribbage all combined into one extraordinary set. Features a unique 11" black leatherette board accented with beautiful white stitching. Just below the board is a storage compartment to house all your game pieces (all included of course). This set has it all and is being offered at a great price! This practical oak wood combination chess backgammon & checkers game set covers it all. Chess and checkers can be played on one side of this set's game surface. On the opposite side, all the accessories you need for a game of backgammon. Features a compact design with with a built-in carrying handle for easy transport. The interior of the case is recessed with magnetic strips to keep the set secure while closed shut. Inside the game set there is plenty of space to store all of your game pieces. Includes: 32 weighted and felted chessmen, 3.25” King, wooden checkers/backgammon pieces, 2 leather dice cups, dice and doublers. The set measures a full 16" x 16" providing ample room for your gaming enjoyment. This fabulous multi-game set combines six different games in one fantastic gaming package. The set includes backgammon, checkers, chess, cribbage, dominoes and playing cards. Underneath the board, you will find a storage compartment for all your game pieces. A great set at an amazing price! 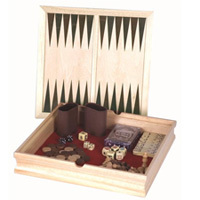 This versatile wood combination backgammon , chess & checkers game set has it all. Chess and checkers can be played on one side of this set's walnut playing surface. On the opposite side, everything one needs for backgammon play. Features 3 games in compact carrying case with a convenient carrying handle. The interior of the case is lined with magnetic strips to keep the set ends secure while in closed position. Inside the game case there is plenty of room for storage of your game pieces. This game set includes 32 weighted and felted chessmen with a 3.25” King, wooden checkers/backgammon pieces, 2 leather dice cups, dice and doublers. The set measures 16" x 16" which provides plenty of play space for your enjoyment. This interesting oak wood set offers three different games all combined into one exciting package. Features solid brass latches and a carrying handle. This Combination Set has all you need to play backgammon, chess and checkers. Inside the carrying case there is plenty of space for storage of game pieces. The set includes 32 weighted and felted chessmen with a 3” King, wooden backgammon pieces (which also can be used for checkers), 2 leather dice cups, 4 dice and doublers. The set measurements when closed are 15” x 10”. A fabulous piece with a practical fold away design at a great price! This 7 in 1 portable burl wood combination game set offers seven all time favorites: backgammon, chess, checkers, dominoes, cards, dice and cribbage. Includes chess and backgammon/checker pieces, dice and dice cups. After game play, this entire set folds up and can be stored away within its own portable matching case. A great combination set at an unbeatable price.